What? 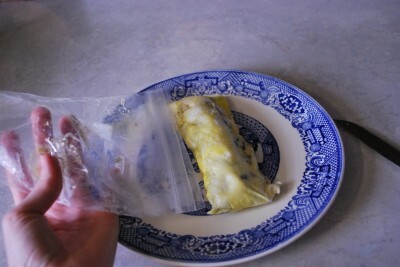 Ziploc omelet? What the heck is that? It’s magic my friends…..pure magic. If you make this, you’ll astound your friends and neighbors. Your kids will think you’re a genius and volunteer to do the dishes……ok, so maybe not that last one, but they will think you’re pretty cool. Ready to be a pretty cool parent/neighbor/friend? Let’s go! To make our omelets we of course need eggs, but we also need salt, pepper, cheese, peppers, mushrooms, green onions, butter, and Ziploc bags. If you don’t like peppers and mushrooms, you could use toppings you do like – bacon, sausage, zucchini, pepperonis, peanut butter, chocolate chips, Reese’s cups. Ok, this is the REALLY important part. Are you listening? Turn off the TV. Ok, here you go – use quart sized bags. That’s it. Why? Who knows why. The recipe says to do it, so I did it. When you’re dealing with the possibility of something exploding in your kitchen, you usually listen to the recipe. See, I’ve written my name on the bag. If you’re making omelets for various people, they might not all have the same stuff in their bag. Cletus might not want green onions, and you need to make sure you keep Cletus happy. In a skillet, melt your butter. Yum, butter! I love butter…..butter makes me happy. 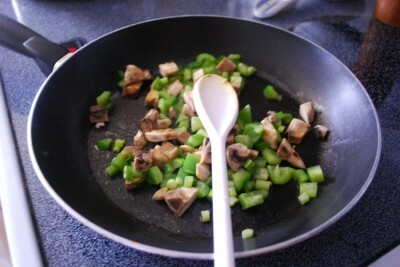 Add the chopped vegetables that you desire and cook them until they’re no longer crispy. I don’t know about you, but I don’t like to chomp through my omelet. If you were doing bacon, you’d add it to the skillet. 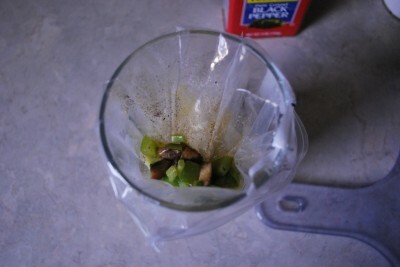 If you chop it up before you add it, it will cook a LOT faster. Learned something, didn’t ya? Grab a large drinking glass and stuff your bag down into it like this. 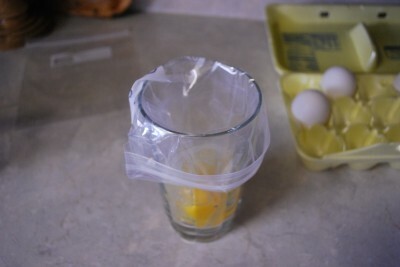 It’s going to hold your bag for you so you don’t get egg goop all over the place. Fold the top of the bag over the sides. Viola! Cup holder. 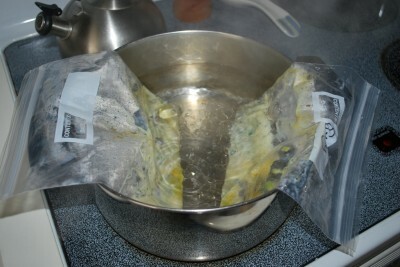 Break two eggs down into each bag. Two I said! Do not do one. Do not do three. Only two must be put into your bag. Remember – exploding bags of eggs? Now, pull your bag out and shake it up. Make sure the top is closed or you’re holding it very tightly…….trying to shake it up otherwise would be like forgetting to put the lid on the blender – not that I’VE done that or anything. Put your baggie back down into the cup. Everyone can boil water. Ok, so not EVERYONE. If you can’t boil water, stop reading this recipe right now and go to Hardee’s (that would be Carl’s Jr. for all you folks out west). Thank you. You’ll need a big pot so you can cook several omelets, plus the eggs need to have room to move around. You can put up to 5 bags of eggs per pot. If you have a big family, use two pots. Pot, pot, pot. Pot is a funny word. We once thought our neighbors were growing it……or making crystal meth. Not sure. I have a vivid imagination. Anyway, bring your water to a rolling boil. Ok, back to our egg cups! 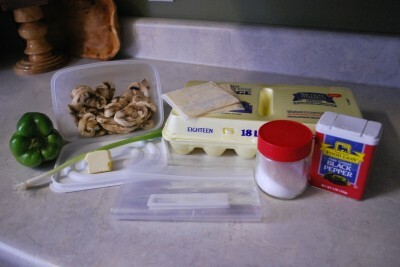 Add the desired ingredients to your bag of eggs. Be creative. Remember it’s your very own omelet. The bag says so. You don’t have to make a big omelet to please everyone……it’s like Burger King! Your way, right away. It seems as though I’m endorsing Burger King and Hardee’s in this post instead of trying to get you to make an omelet. Pull the bag out and mix well. WELL. Make sure you don’t skip this step like me. I normally love to shake things up, but somehow I forgot it this time. I just pulled it right out and zipped it up. If you forget the mixing step, you’re making a big mistake. Barry took a bite of his omelet and spit it out on his plate. “It’s CRUNCHY!” Huh??? I took a bite of mine. I spit it out. Yep, it was crunchy. Silly wife didn’t mix it up and the salt settled down in one corner…..oops. I promise I’ve never done that before when I make these! I learned my lesson. Learn from me, children! Oh, and the rest of the omelet was fine….it was just the one salty, crunchy corner that would give you a heart attack. Ok, when you zip your bags up make sure that you get all the air out. If you don’t, it will explode. I am not kidding. The recipe said so. It’s not happened to me, but the recipe stating that scared me enough to know that I need to make sure to get it ALL out. I don’t want to clean egg off the wall. Or let Dottie lick it off the floor. 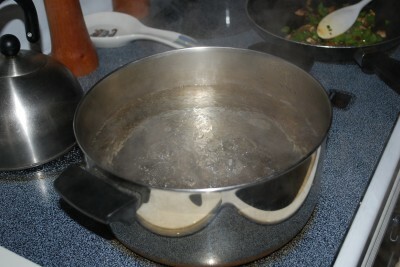 Add the bags to the boiling water – no more than five per pot, remember? Let the top of the bags hang over the side of the pot. I like to turn mine occasionally while they’re cooking, to make sure they get done on all sides. 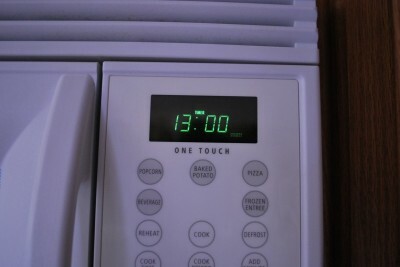 Now, they need to boil about 13 minutes. I boiled mine for 15 because I wanted to make sure they were good and done. I cannot stand runny eggs. EWW! I runny away from runny eggs. Gag attack! Shew, ick! When they’re done, pull them out of the water. Watch out, they’re hot! Let them rest for a second until you can handle the bag. When you open them, they’ll fall right out of the bag when you turn it up. Look! It’s true! It’s a miracle! I know you totally didn’t see that coming, did you? Your kids are standing around you totally amazed. Their jaws are dropped. You’re a GENIUS! It’s ok to gloat. We make these when we go camping sometimes. 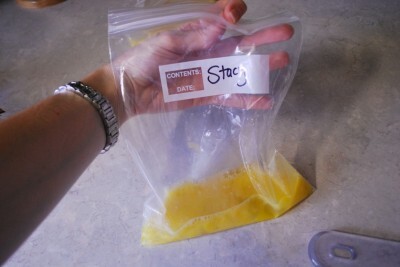 We will put our eggs in the bag, mix them up and then freeze the bag. They’ll thaw while we’re camping and then they’re ready to have the ingredients added to them. You could freeze the ingredients with them, but it won’t be as fresh.Go forth and make magic eggs my friends. You will be amazed! Guess what’s for Christmas Eve breakfast? I tried this and my bags melted. 🙁 Do you have any advice for avoiding that? Danielle, I’ve made this recipe tons of times and never had that happen! I’m very sorry! Hmmmmm, did your bags melt in the water? 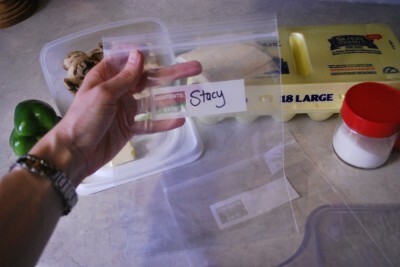 It might take a really strong bag, like Ziploc brand instead of a thinner off brand type? I really want it to work so I’m going to keep trying. 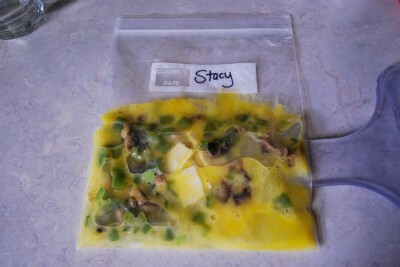 I have picky kids that don’t like things in their omelets and DH likes mushrooms and onions and I don’t so this would be great if I can get it to work. Danielle, I hope you get it figured out! I make them all the time and that’s never happened to me……you must have really hot pots. 🙂 Please keep me posted. I was just thinking about you yesterday. I haven”t tried to make an omelet in years due to a lack of success in the past. I’m going to try this method. My husband will be amazed if it comes out! Wish me luck! AMAZING! This is the smartest idea I have seen in a long time! Thanks for sharing! Ingenious!! 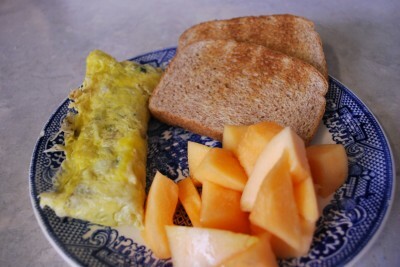 With several to feed, it has always been a little bit of a hassle for everyone to agree upon what kind of omlet today? Now everyone can have their own gourmet order — with less hassle for the cook!! Thanks.